Okay, okay, so it didn’t melt Santa’s workshop. Don’t worry, kids, he’s safe. But 74,000 years ago, a volcanic eruption on Sumatra Island that was 5,000 times larger than the Mount St. Helens blast in 1980 caused acid to rain on both the north and south poles! 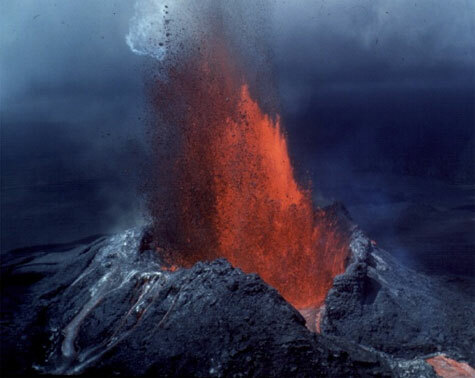 As for the supervolcano’s lava, there was enough spewed forth to create two Mount Everests—yes, two. For years, scientists have debated whether the massive amount of ash and gas that this eruption sent shooting into the atmosphere was responsible for cooling the planet, sending sulphuric acid raining on the poles, and causing severe devastation for early mankind—not to mention whether those effects have lasted. Previous studies have suggested that the Toba volcano caused a 1000-year ice age, with only ten thousand humans surviving… while another study located evidence that suggested humans were having a lovely time living and thriving in India not long after the eruption. Which one is correct? Turns out a new study that looked at ice cores from acid rain-tainted areas in Greenland and Antarctica suggests that despite the magnitude of the blast, it might not have been so bad after all. The Antarctic core actually shows traces of a warming event not long after the supervolcano’s eruption, happening around the same time as a cooling signal that was found in the Greenland cores. What does this mean? “That means there’s no long-term global cooling caused by the eruption. There may have been a shorter [global] cooling of a duration of maybe 10 or 20 years, like we see for more recent volcanoes,” said Anders Svensson, co-author of the new study on the Toba eruption. Considering that these more recent volcanoes are not nearly as powerful as what happened to Sumatra’s Toba, this is significant. Toba didn’t cause long-term cooling, and it seems that humans thrived on, regardless of the circumstances caused by the eruption—which is remarkable, because the volcano’s fallout is thought to have had environmental impact as far away as India! 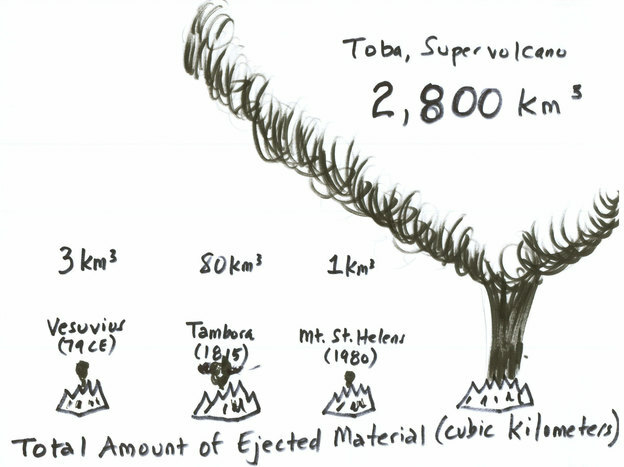 While scientists are still learning more about what happened during and after the eruption through ongoing analysis of the ice core data, you can read more from the Toba volcano study in the journal Climate of the Past. Over two thousand years ago, the Thracians thrived near the mouth of the Danube River… but who wouldn’t, if they lived near one of the largest ancient supplies of gold? Ruled by a warrior aristocracy, the Thracians had an excellent trade relationship with their neighbors, people like the Scythians (north) and the Greeks (south), and we’re able to see this in the art they created. We see this history of incredible gold metallurgy reflected in a discovery of a 2,400-year-old treasure in a Thracian tomb in Sveshtari, Bulgaria! The tomb is the biggest out of 150 known tombs from an ancient Thracian tribe named the Getae. The image here shows a golden horse head, which would have been an ornament from one end of a long-disintegrated iron horse bit—and alongside it to the right is a ring or brooch with intricate design work. Below are tiny gold busts of a woman that are thought to have decorated a piece or pieces of clothing. 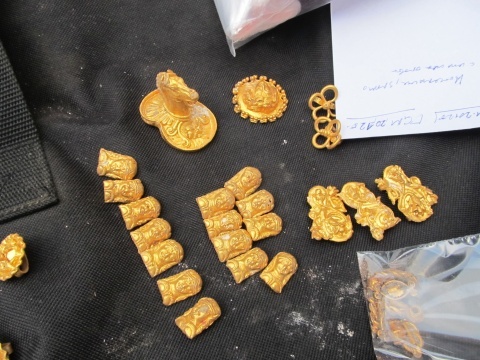 Other items like rings and threads of gold—likely part of a gold cloth that wrapped these items—were also found among the hoard. Initial speculation is that these items were part of a ritual burial, and the archaeological team which uncovered the treasure says they expect to find a large burial ground nearby during the course of their work.